Some 2,000 years ago, a Jewish penitent misplaced a bronze ring during his climb of a 600-meter-long (about 2,000 feet) pilgrims’ thoroughfare leading to the Temple Mount. While the recently recovered ring is today heavily corroded, its central blue semi-precious stone still sparkles. The ring was recently discovered at the City of David’s Sifting Project in Emek HaTsurim, in a bucket of dirt excavated from a structure on the side of the broad 7.5-meter (24-feet) -wide road that is thought to have housed a ritual bath, or mikveh. According to City of David archaeologists, the worshiper likely lost the ring when fresh from ritual purification prior to his ascent to the Temple Mount. For the past seven years at the City of David National Park in Jerusalem, archaeologists have been excavating a now-subterranean stairway that once served as a main artery to the Temple Mount, beginning at the intersection of the Kidron and Ben Hinnom Valleys. “Every step on this street brought the pilgrims closer to the Temple,” said City of David archaeologist Nahshon Szanton, in a recent video tour of the site. “Imagine to yourselves the joy, the songs, the prayers, the spiritual journey that these people experience when they know they are just meters away from reaching the gates of the Temple,” he added, while climbing the monumental staircase. The pilgrims’ road, which ascends from the Pool of Siloam to the Jewish Temple, dates to no earlier than 30-31 CE, during the time of the notorious Roman governor Pontius Pilate. In the short video, Szanton emphasized that this was the period when Jesus was sentenced to death. According to the City of David, the Herodian road was lined with shops and businesses to serve the thousands of pilgrims to Jerusalem on the major holidays. The broad road is a monumental achievement: Szanton estimates that some 10,000 tons of quarried rock was used in its construction. The road was built above a complex drainage system, which rebels hid in 40 years after the Pilgrims’ Path’s construction as the Second Temple was destroyed by the Romans in 70 CE. The drainage channel “was essentially a manmade tunnel,” according to the City of David, and was built underneath the Herodian Road. Its ceiling is made of the rectangular paving stones of the pilgrims road above. The ring is perhaps a testament to a final period of peace, in which pilgrims could still safely climb the path to the Temple Mount and freely worship. The ring is a very human reminder of the people who ascended the path prior to the temple’s destruction, said the archaeologists. “This ring allows us to personally connect with an individual’s personal story from 2,000 years ago. 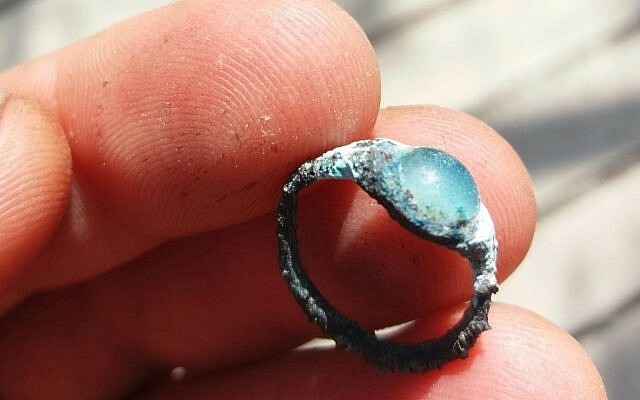 The ring, along with other finds, can shed light and expose the lives of people during the Second Temple period,” they said.